A gold-leafed massager whose elegant shape was inspired by Japanese acupressure. 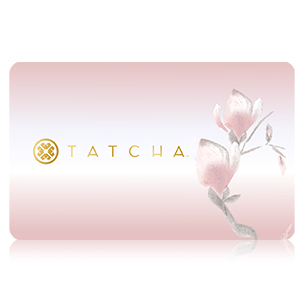 The Tatcha Akari Gold Massager can be heated or cooled to maximize benefits to the skin. $185 | 55 ml / 1.86 fl. oz. The Akari Gold Massager can be used daily to awaken skin, release tension and visibly reduce puffiness, restoring a lifted, youthful look to skin. 24-karat gold leaf around a thermal core. Meaning "morning glow" in Japanese, the Asayake Massage uses a chilled Akari Gold Massager to tighten and awaken skin. Step 1: Glide the massager up along the neck. Step 2: Move upward from the center of the chin along the jawbone, applying light pressure. Step 3: Lay the tool against your nose and move outward along the orbital bone. Step 4: Place the tool above your eyebrow and glide upwards towards the hairline. Repeat five times on each side of the face, using the broad side. This "evening glow" massage uses a warm massager to release tension and detoxify through lymphatic draining. Step 1: Begin just above the hairline and move in a back-and-forth motion on the scalp. Step 2: Press the massager above the inner corner of the eyebrow and slide outward along the brow, stopping in front of the ear. Step 3: Press tool to the base of the nose and move outward along cheekbone. Step 4: Place the massager behind the ear and draw down along the jaw and neck to the collarbone.Repeat five times on each side of the face, using the narrow side. Meaning "awakening" in Japanese, the Mezame Eye Massage helps rejuvenate and refresh tired eyes. Step 1: Place the narrow end of the tool at the outer corner of the eye. Applying almost no pressure, slide the massager towards the nose. Step 2: Place the tool at the inner corner of the eye and apply a bit more pressure, sliding outward along the browline. Repeat five times on each eye with a cool massager. Akari Gold Massager is rated 5.0 out of 5 by 7. Rated 5 out of 5 by Denise from So gorgeous! This arrived today (a special birthday treat for myself!) and it is just stunning. The tiny imperfections in the golden surface just cement that its not some form of paint, but rather a real sheet of gold leafing, I rushed right over to get a cup of hot water to put it in, so i could try it out with the Yuyake evening massage. Gentle heated bliss. I can tell I will also be using this when i have sinus pain issues and want a quick warm therapy. Rated 5 out of 5 by Cynthia from 5 star product! Beautiful (as are all things Tatcha) and perfect for facial massage. 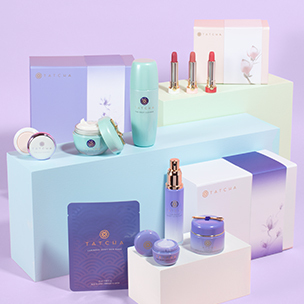 I found Tatcha a couple of years ago and am really pleased with all products I've ordered. 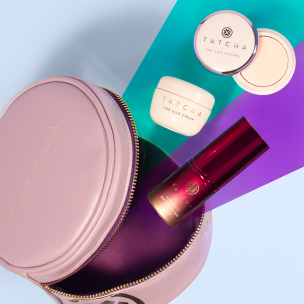 Gorgeous packaging, amazing customer service, exceptional products ... love, love, love all things Tatcha! The redesigned Akari massager is an integral part of my am and pm facial routine. Highly recommend this item! Rated 5 out of 5 by Anonymous from Love this! I splurged on this as a birthday gift for myself and what a treat. I use this before I go to sleep and when I wake up in the morning. I'll most likely buy a second one to keep at room temperature but I have to say, I really love this massager. Rated 5 out of 5 by Anonymous from Meditate with this massager! Purchased this to add to my daily Tatcha rituals. The massager is beautiful both in aesthetic and quality. I find it to be a lovely form of meditation morning and evening or whenever I need a moment to soothe and refresh. Rated 5 out of 5 by Kat from I prefer the old massager. To be honest, I kind of prefer the old Chrystal Akari Massager more. I wonder if they still have it. But nevertheless, this massager looks so fancy. Rated 5 out of 5 by Kat from I prefer the old massager. The Akari Chrystal Massager looked more appealing, in my opinion. But still, this massager looks like such a real treat. Thank you for your question! The gold leaf is sealed onto the inner core so that flaking will not occur. We hope this helps! Can I use this with the water cream instead of the age renewal cream? Thank you for your question! We suggest using our Akari Gold Massager with the Ageless Enriching Renewal Cream because the tool needs something applied to the skin to assist with slip so that the massager will glide effortlessly while in use. Most of our friends find that the Water Cream sinks in quickly and completely which would not provide the same benefit as a richer cream, but if you find the opposite to be true for your skin, then it should work sufficiently. Another option is to use another product in your collection that you find that stays moist on the surface of the skin for at least a few minutes while you use the massager. We hope this helps! Is there an age limit for using the Akari Gold Massager and Ageless Enriching Renewal Cream? More specifically, is it possible for someone to be too young to use such ingredients/products on their skin? Thank you for your question! The Akari Gold Massager and Ageless Enriching Renewal Cream are both preventative as well as reparative for skin making them ideal for a wide range of ages interested in maintaining a youthful look and glow. We hope this helps! What are the benefits of the Akari Gold Massager and massages? The Asayake &ldquo;Lifting&rdquo; Massage is designed to awaken and tighten skin, while the Yuyake &ldquo;Detox&rdquo; Massage relaxes and purifies skin. The Mezame &ldquo;Awakening&rdquo; Massage helps to rejuvenate tired, puffy eyes. Can I use both ends of the Akari Gold Massager? Yes. Each side of the tool is intended for slightly different use. The broad side can be used for wider strokes around the sides of the face, while the narrow end is ideal for delicate massage around the eye area. What size is the AGELESS Akari Gold Massager? The tool weighs 1.8oz and is 3.5&quot; long, with a width of 0.5&quot; at its widest part.